Welcome back to our blog series on some of the most common problems to befall your HVAC unit. In part one, we discussed the HVAC issues of dirty and clogged filters, broken thermostats, and dirty or frozen coils. We also discussed the importance of not allowing issues with your HVAC to go unattended because certain problems can lead to bigger consequences, which means that you’ll be paying out more than you would have if the problem was addressed at the first sign. As units age, we tend to rely more and more on our HVAC service professionals. You might start to see issues with air quality, airflow, or air temperature. When these differences start to show themselves, it’s vital that you seek out your service pro. Don’t have a service pro yet, Benjamin Brothers would love the opportunity to work with you! In today’s blog, we’re going to look at a few more common reasons for your HVAC unit’s poor performance. Lack of maintenance, low refrigerant, or blocked or leaky ducts are all problems that may crop up during the life of your unit. Continue reading below to learn more! We all know that we’re supposed to get our units inspected on a regular basis, but we also know that life can get busy and these things can sometimes fall by the wayside. According to Angie’s List, a unit can lose as much as 5% of its efficiency per year if it’s not been given regular and routine maintenance. Dirt, dust, and other allergens tend to accumulate on your unit and eventually, you’ll start to notice this affecting your air quality. It’s recommended that you get your HVAC inspected at least once per year, and preferably in the spring to make sure that your unit is ready to take on the hottest months of the year. Repair: Usually, even if you haven’t been quite as diligent as you should have been with your HVAC’s regular service calls, your AC pro can usually get your unit back to where it should be. However, if it’s been ten years and your unit has never seen a technician, you might be facing some significant repairs and if that’s the case, it may be more cost effective to replace your unit. A common HVAC problem that people have reported is low refrigerant or a refrigerant leak. When this occurs, you’ll start to notice that your home simply can’t stay as cool as you’d like. Due to the lack of a proper amount of refrigerant, your unit simply can’t keep up with what the thermostat is instructing. If this problem isn’t addressed quickly, your unit will continuously run in an effort to match the thermostat and, as you can imagine, this will put so much unnecessary wear on your unit. If you suspect that you might have a leak or you have noticed that your HVAC doesn’t shut off, go ahead and give your service pro a call. Repair: If the problem really is simply low refrigerant, your technician can simply add that to the reservoir. However, in many cases, the refrigerant is low because of a leak. Because a leak can lead to significant other damage inside your unit, it’s vital that you seek your AC professional to get this problem repaired as soon as possible. Most people don’t realize how huge and overarching their HVAC system actually is; it’s so much more than that noisy, large box on the side of your house. Your heating and cooling system goes through your entire house with a series of insulated ducts that carry the air from your unit to your vents. These ducts are designed to allow for steady airflow and great circulation. However, if for some reason, one of these ducts becomes obstructed for some reason, you’ll definitely be able to feel a difference in airflow. In addition to this, if something causes one of your ducts to develop an air leak, this will also affect not only the airflow but also the air quality that your home is receiving. 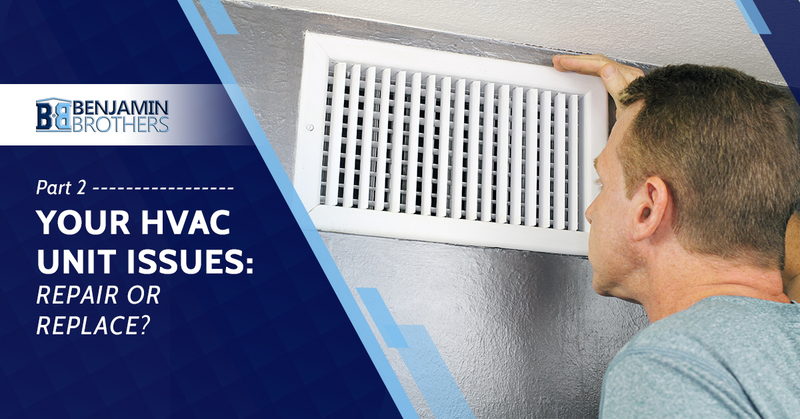 If you believe that you might be dealing with a blocked or leaky vent, call your HVAC service pro ASAP so that they can address the problem and get your system back up and running well. Repair: Since this has nothing to do with your actual HVAC unit, the repairs needed are more for the leaky or blocked ducts. Your service professional will be able to find the leak or blockage and fix it. Once this problem is addressed, you’ll be able to feel an immediate difference. For many of us, our HVAC units are out of sight, out of mind. We tend to expect that our unit is always going to perform the way that it’s supposed to and the way that it has thus far. But we know that nothing lasts forever, and especially if your unit is more than five years old, it may be due for some repairs. Or, in the event that your unit is needing so many repairs that it’s cheaper to purchase and install a new unit, you’ll definitely want to chat with your service pro to figure out the most cost-effective option. If you’re starting to notice issues with your HVAC unit or if it’s time for its regular service, give Benjamin Brothers a call! We’d love to hear from you and give you a free estimate.